Happy Fall! ...or Happy Spring to our friends down under! :) This time of the year marks either a harvest or a rebirth depending on your position on the globe. Regardless, it is a time where cycles are ending and new beginnings are afoot. What new cycle are you entering right now? How about your child? New jobs, homes, developmental phases, birthdays, 1st days of school, new classes, peers, adventures? How can we prepare our children and ourselves for these new transitions? One great way is by remaining in the heart space. When you feel stressed or angered, the fastest way back to calm is through your heart. Did you know that your heart has its own central nervous system and that there are more pathways connecting your heart to your brain than there are connecting your brain to your heart? The heart is responsible for much more of our emotional sensations and flexibility than previously thought. Emotions are not just mental expressions. There are important physiological changes behind our feelings. The GREAT NEWS is that we also have the power to guide our emotions where we need, regain our sense of personal peace and this power lies within our own hearts. Check out Transforming Anger: The HeartMath Solution for Letting Go of Rage, Frustration, and Irritation if you or your child struggles with anger and learn how to harness the power of your heart. And check out our Facebook discussion for more on the heart-brain-body connection. 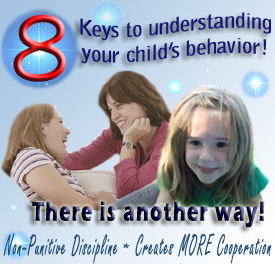 If you are a parent struggling with difficult behaviors, you may have reached the end of your rope and not sure how to cope or how to help your child. Heather Forbes (Beyond Consequences Institute) is holding an online conference Every Day is Mother's Day to support Moms is making the shift from fear to love. This online conference is designed to help you return to happiness, love, and peace by removing the imprinted patterns in your brain that keep you lost in cycles of fear and pain. You know that you have to do something to make a change. But how do you clear emotional pain and let go of the unconscious memories that may be influencing your present-day actions? Find out during this 5-day online retreat. Did you miss our Stress Proof Your Kids Webinar? It was so successful, we'll be holding another session on WED 10/6 @6pm Pacific. Learn more about stress-proofing your kids in this complimentary online parenting class with clinical therapist Elizabeth Walther. Join me on October 6th for this informative webinar and receive special discounts on classes and products. LOCATION: On your computer or phone! Learn to identify the feelings that accompany behavior. Download and share the POSITIVE FEELINGS LIST and the NEGATIVE FEELINGS LIST.